Spain is known for the Great Run of Bulls, a bone-chilling sport, which was filmed in the Bollywood movie Zindagi Na Milegi Dobara. Most Indians got to know it after the release of the film in 2011. Can India challenge Spain in such a furious adventure? Can India contest Spain in such a breakneck sport? Of course, India can. One of the most offbeat sports in India is held in the rural backwaters of Kerala. It is neither hiking nor snowboarding nor scuba diving nor paragliding. It is Kerala’s bull race in the paddy fields. Explore, with Indian Eagle, what makes Kerala’s bull race more furious than Spain’s national sport bullfighting. India, an agro-economy based nation, welcomes and celebrates the harvesting season as a gala. Post-harvesting festivals are celebrated with boundless enthusiasm all over the country. But, among the states of India, Kerala makes headlines for the ultimate frenzy of its post harvesting festival that is a bull race, locally known as Maramadi. One of the most offbeat things to see in India, Maramadi is best known and a must see for the relentless spirit of competition among 300 pairs of bulls. Precisely speaking, it packs lots of action and never ceases to send shockwaves down the spine. Maramadi, an exceptional agricultural sport and the most thrilling part of the Kakkoor Kaalayayal, has been a tradition for thousands of years. Bulls are meticulously reared for this wild racing event in Kerala. Each pair of bulls is breathlessly chased by a group of three men, filling the air with gales of excitement. The bulls are left free for a mad run and the men with all the might run with them till the finishing point of the race through the paddy fields filled with water and mud up to 6 inches. It may be rainy or sunny when the festival is held. It is no exaggeration to say that the race is an extraordinary show of men’s physical strength in competition with the beastly force of bulls. The bulls are always restless and impatient. They drive the guides out of breath and pace. At times, they slide and get stuck in the mud. Men too slip in the mud while keeping pace with the animals. Two out of the three men hold a rope tightly to control the direction of the racing bulls’ feet and direct them towards the goal. The third man dares to keep sitting on a plank of wood between the two bulls. 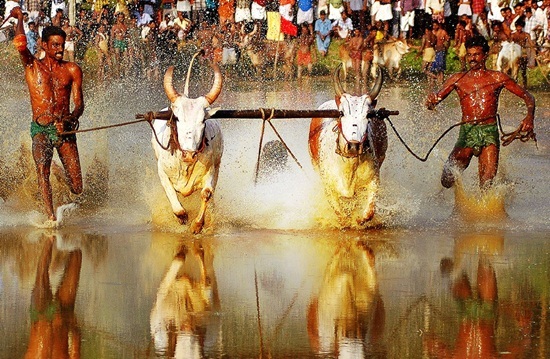 The bull race is a 100 meter run through the muddy and watery paddy fields. The participating or contesting animals can be bulls or water buffaloes. The fastest pairs of bulls or buffaloes are awarded in different categories. The muddy field turns into a pandemonium during the race. People from several districts of Kerala gather to witness the fury of competing animals and the vigor of their jockeys. The men guiding the racing bulls are trained like professional jockeys. Travel to explore offbeat places, see offbeat things, visit offbeat fairs and enjoy offbeat sports in India. Indian Eagle books best flights to major airports of India at the lowest airfare, which you may find offbeat.